Roger Dubuis, a Swiss watch manufacturer of some of the most luxurious watches ever, has announced a new and exclusive partnership with Damas. Established in 1995, Damas operates stores across Qatar, Bahrain, Oman, Jordan, Kuwait, Saudi Arabia, Egypt, Libya, Sudan, Italy and India. Roger Dubuis will be sold exclusively at Damas locations across the Middle East and India. Damas is United Arab Emirates-based company. This is a great move for Dubuis as the United Arab Emirates is home to Dubai, the city which has become an extraordinary playground for the rich and famous, achieving levels that even Las Vegas cannot compete with. Those that live in and visit Dubai and the Middle East have a large appetite for luxury goods such as watches and jewelry, and the pockets to satisfy it. Damas will be the only store to carry Roger Dubuis watches and jewelry, including watches from their popular Kingsquare, Excalibur and Easydiver collections. The Excalibur Double Tourbillon Skeleton by Roger Dubuis was unveiled for the first time in the Middle East today, October 1, 2009. Home to the Excalibur family, the Double Tourbillon Skeleton uses the skeletonised version of Roger Dubuis’ Emblematic double flying tourbillon movement, with differential, tourbillon cages visible between 4 and 5 o’clock and 7 and 8 o’clock positions. The round case is made from white gold and measures 45mm in diameter and 7.67mm in thickness. 28 rubies are found on the watch. There are 292 components and the watch has a power reserve of 48 hours. A hand-sewn black crocodile strap with white gold folding clasp top it off. 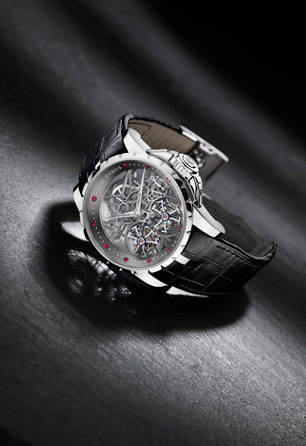 The Excalibur Double Tourbillon Skeleton is one of the most complicated luxury watches on the market today.